Spiny Cheep Cheeps (also formatted as Spiny Cheep-Cheeps or "Cheep-cheeps") are spiked fish, most commonly appearing as dark-colored Cheep Cheeps with spikes running down their backs, although there has been much variation. They are fast swimmers and from New Super Mario Bros. Wii onward, they chase Mario, like a Deep Cheep. In Super Mario Bros. 3, Spiny Cheep Cheeps only appear in one level: World 7-4. They swim faster than normal Cheep Cheeps, though they can sometimes be seen swimming slowly as well. They also swim both left and right. They can be defeated using Hammer Mario's hammers, Fire Mario's fireballs, or by Invincible Mario. In the original, they are black with a white underside and green lips, as well as a visible tooth; in remakes, they are a dull blue with a salmon-colored underside and lips a slightly lighter shade than those of the average Cheep Cheep, and a toothless, circular mouth. The Spiny Cheep Cheep is a fairly rare enemy in Super Mario Land 2: 6 Golden Coins, and it appears only in the Turtle Zone. Unlike its other appearances, it is flat and slender, almost eel-like, but it regularly inflates itself into a spiked ball. When inflated it can only rise upwards, so it moves towards Mario when deflated and attempts to block his path by puffing up and getting in his way. Spiny Cheep Cheeps can be defeated with Fireballs. Another pufferfish version of this enemy appears in the game Super Mario Galaxy. They are quite rare, as only two appear, specifically in the Drip Drop Galaxy, hidden in underwater chests. When released, they will puff up and start swimming at a fast pace towards Mario, but only move in a straight line. After a short period, they disappear. Their tail fins resemble balloon nozzles in this game. This Spiny Cheep Cheep is internally referred to as "Balloonfish." Spiny Cheep Cheeps reappear in New Super Mario Bros. Wii. They first appear in World 1-4 and later in world World 4-1 and World 4-4. A single Spiny Cheep Cheep also appears in a secret area in World 8-4. Once it catches sight of Mario, Luigi, or the Toads, it will hunt them down. Though small, the Spiny Cheep Cheep is quite fast and relentless in its chase; more so than the Deep Cheep. 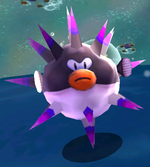 They can be frozen using Ice or Penguin Mario's ice balls, but like all spiked enemies in the game, they will not stay frozen for long. Once it unfreezes, it has an angrier look on its face, the same one a Deep Cheep has. This does not affect anything it does. A single Spiny Cheep Cheep appears in Super Mario Galaxy 2. It only appears in the first mission of the Cosmic Cove Galaxy, where it appears without any warning, and then swims at Mario like the ones in its predecessor. 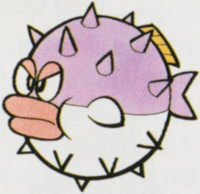 It is referred to as a Porcupuffer in the Prima Games guide. 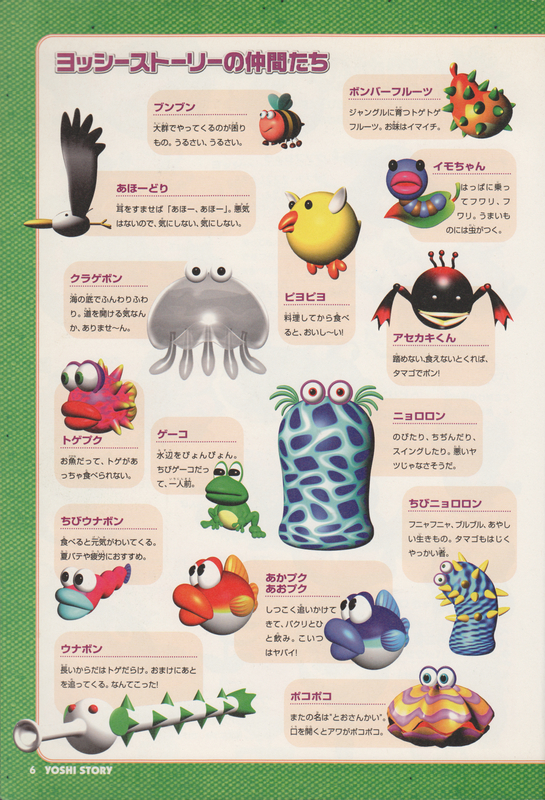 Spiny Cheep Cheeps also appear in New Super Mario Bros. 2, where they first appear early in World 1-5. They behave the same way and have the same appearance as in New Super Mario Bros. Wii, except they have an angry look on their faces. Spiny Cheep Cheeps reappear in New Super Mario Bros. U. Like in past New Super Mario Bros. games, they will chase Mario, Luigi, and the Toads once they appear on screen. Spiny Cheep Cheeps also make an appearance in Yoshi's Story, where they are bright pink with yellow spikes and tail, and lack pectoral fins. They are depicted as larger than a Cheep Cheep and have more spikes on their body over where their plain underbelly and pectoral fins are normally located. They have red lips and have green irises. They appear only in the first level of Page 5: Ocean, Lots O'Jelly Fish, where they simply swin back and forth. If a Yoshi eats them, he loses some petals. The English website refers to them generically as "spiny fish." Spiny Cheep Cheeps appear in Yoshi Touch & Go. They are blue with white spikes, and are always leaping. They can only be defeated by smacking them with an egg. In Mario Pinball Land, Spiny Cheep Cheeps (referred to as "little puffers" in Nintendo Power) assist Porcupuffer, the boss of the Frosty Frontier Stage. Rather than black or purple, these Spiny Cheep Cheeps have a red and white coloration, retain a dorsal fin akin to a regular Cheep Cheep, and have spikes around its body. In Mario & Luigi: Superstar Saga + Bowser's Minions, Spiny Cheep Cheeps appear in Oho Ocean Seabed and replace both Cheep Cheeps and Puffer-Cheeps. However, they have identical behavior, first appearing as plain, purple Cheep Cheep and shedding its "mohawk" in favor of retractable spikes when stomped. Damaging it again reverts it into its previous form. In Super Mario Party, a Spiny Cheep Cheep makes a cameo appearance in the minigame Absent Minded, where it is one of the characters that can be chosen as a guess. Unused graphics from Super Mario All-Stars resembling those of the NES version. Mario fighting Porcupuffer and Spiny Cheep Cheeps in Mario Pinball Land. French (NOE) Pik Cheep (Super Mario Galaxy 2) Distortion of the word Porc-épic meaning "Porcupine"
↑ Nintendo Power Strategy Guide for Super Mario Bros. 3, page 9. ↑ Super Mario Bros. 3 English instruction booklet, page 26. ↑ Mario Character Book, page 123. This page was last edited on February 11, 2019, at 16:38.